We all have the fear of disclosing the financial position while purchasing the services or products online and through call center agents. Many of us already facing these problems of leakage the financial information of us. To minimize the risk of leakage the financial information of our clients, Avatar dialler introduces the new feature named Payment Card Industry (PCI) compliance to our customers. Avatar PCI Compliance Reliable For Your Business! 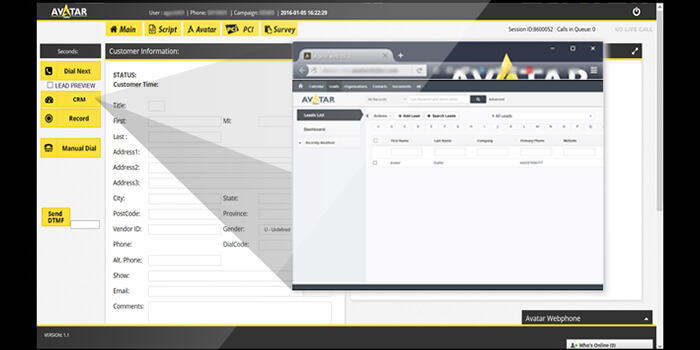 Avatar Dialler gives you an opportunity to secure your customer’s card information with the usage of PCI compliance not to secure card info but also save your customers and loyal with your call center. So there is not even a question about the information leakage of your card as PCI Compliance set an IVR for taking your financial information thus ensures the safety that you need. Why Your Call Center Need Avatar PCI Compliance For Your Customers? Avatar PCI compliance can help you to achieve the trust and loyalty of your clients, for instance, your customer has full grip and control around the storage, transmission, and processing of his card data by Avatar PCI compliance. Call center industry has a wide range of software and a lot of competition in the software market nowadays. Software houses make new technologies and strategies for their clients to provide them a better and safe path to share their financial data without having any fear. Read below how PCI compliance make the customer satisfaction and loyal with your call center business! How You Get The Confidence Of Your Customers? Your business will be successful when your customer keeps reliable on you and make their confidence in you. To get the confidence of your clients, you have to make sure them that their personal data and secret information will be kept secret and secure. PCI compliance increases the confidence level of your clients and they keep relying on your business. This feature is work as a robot or machine with whom you are sharing your card information, not with the agents. This data neither save to any place nor recorded by the company, that means your card information will be hidden and safe. Is This Easy To Ensure Your Customer? As I discuss above, PCI compliance is work as a machine without recording the call and saving the data information at any place, it’s mean your personal information will be kept safe and personal. This statement ensures your clients, enhance your customer’s trust in your business and the name of your call center mention as trustworthy. By adopting Avatar Dialler’s feature PCI compliance your client ensures about the safety of their financial information because they never think this kind of transaction safe and secure become the reason of avoiding from this services as they were faced this problem in past or be heard the news of cybercrime. Is Your Customers Expanding Your Business? To keep the work fluent in your business you need to have the loyal and satisfied clients in your contact list. But how you make them loyal to your business? Simply through satisfaction, ensure them secure, safe and fair in dealing. How you expand your business? When your current clients are satisfied with your business, definitely they will tell to their friends, family, colleagues, and circle where they belong, that will be the reason to expand your business growth, Avatar PCI compliance not only secure your call center business but the reason to increase the numbers of customers. IVR is the automated voice response systems that ensure your customers while sharing their personal card information and providing your call center their private financial position. It is therefore safe and fault-free system of accepting payments as your information is not shared with your agents and system. Online fraud, money transaction problem, disclose of the personal assets, leakage of card information is common in nowadays. Customers of the call center industry and online buyers are worries about this mishaps. They think before disclose their personal data with the agents or company, the reason is fraud. There is less reliability in business as an increase in the numbers of call center and online systems. Avatar dialler eases the hassle of fraud by providing his feature PCI compliance set an IVR for taking your financial information thus ensures the safety that you need. It is the best option to keep secret the personal information of customers and keep them reliable for your business.